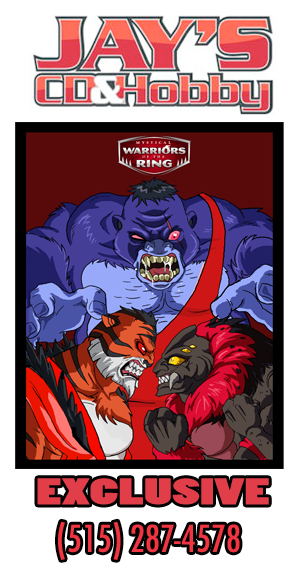 Mystical Warriors of the Ring is a 1 1/2-2″ toyline created independently. The basic concept and designs are mine, however the 2D artistic duties are handled by my great friend in India Jazyl Homavazir (Creator of indie comic Beast Legion), sculpting is handled by the incredibly talented Simon Grell , and prototyping/production is handled by my friend of 10+ years Marty “THEGODBEAST” Hansen. We have also retained the services of many artist friends to help us out from time to time on packaging art, these include talents from Hasbro, Marvel, DC and various indie companies. The idea is simple, if you were ever a fan of wrestling from 1970-1995 (Prior to the explosion of ECW/Attitude Era) then imagine that world of big characters and over-exaggerated stories in anthropomorphic form. If you have ever enjoyed small collectible figurines like SOMA/M.U.S.C.L.E or more modern lines like O.M.F.G. or The Trash Pack then you will hopefully be in for a treat. Q. I missed out on a prototype release, will you re-release figures? A. We will take a lot of factors into account, if there is a need to re-release figures we will try to accommodate the demand but the we make no guarantees. These are being done on a limited scale and first come first served will apply, especially for the Convention releases. Q. I am international can I buy these figures? A. Yes we ship worldwide, if its in stock in the store it can ship to any country. Shipping charges are based on total weight of the product. Q. I want to work with you, how do I do that? Would you be interested in a crossover? A. I am always open to working with others, however this is my brand so there will be some requirements as I have a high standard as to which production/packaging/promotion is done. You are free to email me at webmaster@fantasticplastictoys.com to inquire. Q. You said the Tickets that come with prototype figures would be used for something, can you elaborate? A. Each of our major releases is themed like a Pay Per View Event, because of this they will have Event Tickets. The stubs of these tickets can be used at the end of the year to mail in and redeem to purchase a Extremely Limited Edition 2014 Preview Figure at a special discounted price (details about the mail away figure for 2014 are here). Q. Will every figure released as a prototype be released in mass production PVC? A. While it is our goal to get our entire lineup out in mass production for retail, due to the expense of production that intially won’t happen. We have selected the PVC characters based on their cost effectiveness, we have also modified certain characters who may appear in production to be different from their prototype releases to allow for collect-ability. One Response to What is MWOTR?